Dr. Sterling is interested in various aspects of observational and theoretical solar physics. Following his graduate studies, Dr. Sterling spent one year as a postdoctoral researcher at the Naval Research Laboratory (NRL). Subsequently, he has spent over fifteen years years in Japan: the first two years as a postdoctoral associate at Kyoto University, followed by eight years as a contractor for NRL while working at ISAS, outside of Tokyo, as part of the Yohkoh (Solar-A) solar satellite project. Dr. Sterling then completed a two-year National Research Council Senior Associateship with the Solar Physics Group of Marshall Space Flight Center in Huntsville, Alabama. Following the NRC Associateship, Dr. Sterling was hired as a NASA Civil Servant and shortly thereafter, he returned to Japan as the NASA liasion for the Hinode (Solar-B) solar satellite project, a mission led by Japan with participation from the US through NASA, and other nations. In addition to research, Dr. Sterling also acts as the NASA Chief Planner for the Hinode solar satellite. Among Dr. Sterling's research interests are spicules and coronal mass ejections (CMEs), solar atmospheric phenomena that occur on various size and energy scales. 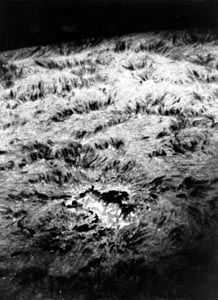 Spicules are among the smallest observed dynamic solar features. They appear as jets of relatively cool (chromospheric) material which extend into the hot outer atmosphere (the corona) of the Sun. They reach heights of about 10,000 km, and an individual spicule may carry 1026 ergs of energy. Coronal Mass Ejections, or CMEs, are among the biggest and most energetic solar phenomena. A CME can grow to several times the size of the Sun, and carry 1032 ergs or more of energy. CMEs are of more than just theoretical interest however, since they are capable of damaging satellites and other human systems. Dr. Sterling has researched the properties of spicules and CMEs, and the physical mechanisms for their occurrence and has identified possible signatures of impending CMEs; such signatures may eventually be of practical use in predicting CME onset, and serve as warning signs for CMEs which could damage electronic and satellite systems.